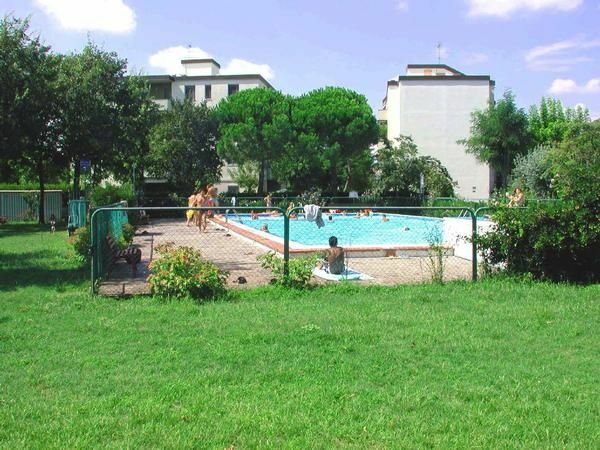 The 3D complex is in the centre of Lido di Spina, approx 700 metres from the sea and 200 metres from the shopping centre. It is subdivided into blocks of four floors each with a lift. In the recreation area there is a large park area with an adult and a children's swimming pool (open ca 01/06 till 15/09) which can be used free of charge. There are three types of apartment in this block. One bedroom (approx 45 mÂ²) sleeps 3+2: One bedroom with double bed and single bed. Living room with sleeping space for 2, separate kitchen with freezer box, bathroom with shower, large balcony with garden furniture. TV socket, windows with mosquito nets, air conditioning, washing machine, microwave. reserved parking space. Bed linen: once per object for rent at a price of 5 EUR (optional). Towels: once per object for rent at a price of 5 EUR (optional). Final cleaning: once per object Costs amounting to 50 EUR (optional). Heating: per object and day Costs amounting to 8 EUR (optional). Climatisation / Ventilators: per object and day Costs amounting to 8 EUR (optional). Cot for children: per object and day for rent at a price of 3 EUR (optional). General: per person and day Costs amounting to 3.5 EUR (Mandatory). Electricity: per person and day included in price (Mandatory). Pet: per pet and day Costs amounting to 3 EUR (optional). Wrapped in a flourishing ancient pinewood on the boundary with the province of Ravenna, this is the most residential of the Lidi, and its streets - laid out on a semicircular plan - are set with tasteful low-rise villas, often built by famous architects. These villas can be seen in all seven Lidi but they are particularly typical of Spina. There is accommodation for every need: luxurious, comfortable and quiet, by the sea or in the centre, in the woods or in the more fashionable quarters. Yet here too the large beach and the many bars and clubs are just as much the main attractions. Air condition (per property and day, included in price 8 EUR). Bed linen (once per object, Costs amounting to 5 EUR). Cot (per property and day, included in price 2 EUR). Final cleaning (once per object, Costs amounting to 50 EUR). Heating (per property and day, included in price 8 EUR).